18" cone, Voice Coil:4" 15" cone, Voice Coil:2.5" Diameter:12" cone, Voice Coil:2.5"
The DXS’s high performance Class-D amplifier is capable of producing up to 1020W* of power, realizing an SPL of 136dB, delivered with exceptional clarity and accuracy. *DXS12 and DXS15 deliver 950W power. The high-output woofer features a 4" voice coil magnet and delivers powerful, well-defined, low-frequency bass with minimal distortion. *DXS12 and DXS15 feature 2.5" voice coil magnets. The exteriors feature a LINE-X® coating with extremely high damage resistance to protect the cabinet from scratches and wear, maintaining a professional appearance that can withstand many years of usage. 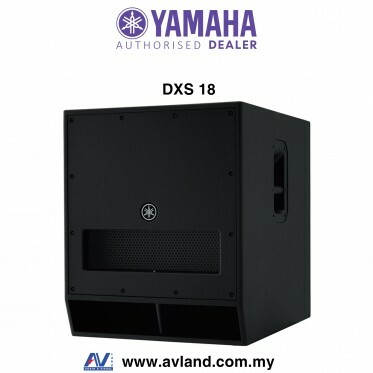 Crossover switching allows users to seamlessly match DXS subwoofers with any of Yamaha’s full-range powered speakers by selecting the cutoff frequency best suited to the models in their speaker array (up to 120Hz). The functional speaker covers that protect your speakers from unfavorable weather conditions during outdoor performances, dusty and dirty warehouse storage, or the rigors of equipment transport on the road.- Trilaminar fabric of durable polyester, with inner PVC coat and cushion inside for impact suppression.- Front mesh allows sound reinforcement with the cover as well as ensures amp cooling. (Only for DXS12/DXS15)- Rear roof allows easy access to the rear panel with the cover on. (Only for DXS12/DXS15)- Handle slit allows easy access to the handles for carriage.- Inner pocket additional space for carrying cables. *NOTE: The covers do NOT guarantee water-drip protection.